It’s almost Cinco de Mayo! 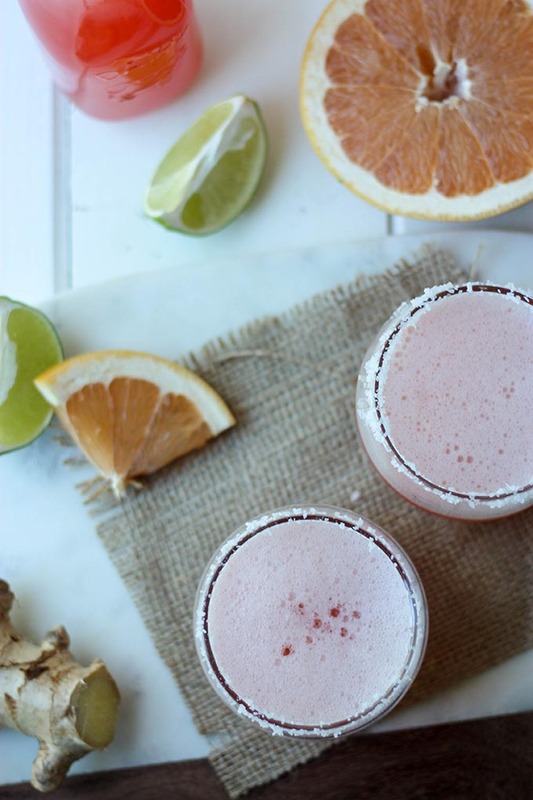 Celebrate with these beautiful and easy grapefruit margaritas with lime. These are the perfect cocktail for when you’re looking for something with a little punch, and a bit of tang. 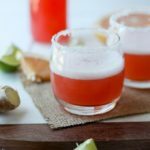 Not too sweet, not to sour, these margaritas are perfectly balanced and so fun for entertaining! We are a participant in the Amazon Services LLC Associates Program, an affiliate advertising program designed to provide a means for us to earn fees by linking to Amazon.com and affiliated sites. If you happen to buy one of my recommended products, I will receive a small commission! Thank you for supporting THCK! Guyyyysssss!I am bringing back one of my favourite margarita recipes! Did you know, before last year I was a margarita maker rookie, and this grapefruit margarita was THE FIRST margarita I have ever made! Since then, many margs have been drunk and I think quite possibly since Mexico, margaritas have become my favourite cocktails ever! So, when it comes to cocktail making, I am a bit of a novice. I don’t own a shot glass, I don’t own a cocktail mixer, and the closest thing I got to be able to shake up my cocktail mix, was a Nutri Ninja. to mix my cocktails, and I’m proud of it! And ya know what, it actually worked really well! With enough ice, these grapefruit margaritas were foamy, icy and oh so delicious! I remember making these last year with my friend Eve (who has since moved to New Zealand boooooo). It was 4pm on a Wednesday and I invited her over for cheeky hump day cocktails! She was basically the best cocktail taster ever. She didn’t even like tequila, but I quote, said these grapefruit margaritas were ‘dangerous’ because she liked them so much, she could easily keep drinking them! Now, my friends, I reckon that is a win! , rather than wasting time and grapefruit pulp making it myself. I am torn between salting the rim, however, and, to be honest, I probably wouldn’t do it again, which is why salt is ‘optional’ in the recipe. I also decided against using triple sec, because, in reality, I didn’t know if I would use it again! 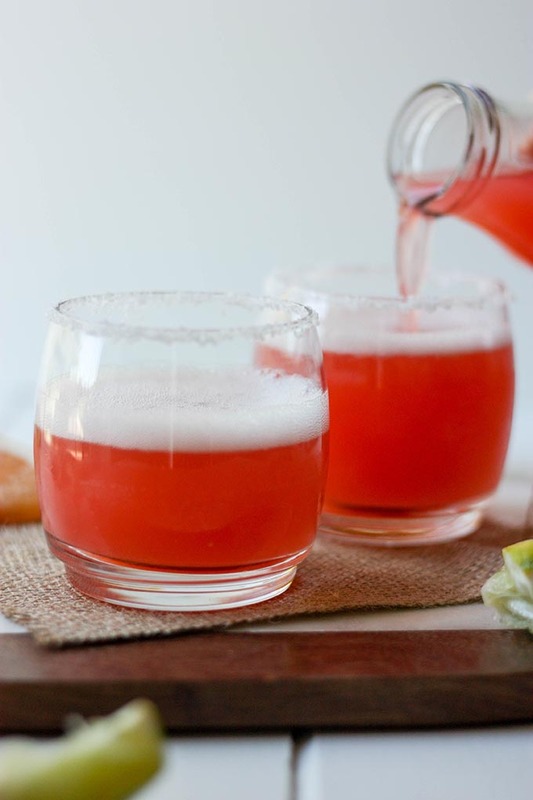 These grapefruit margaritas don’t need any extra sugar, there is sugar in the grapefruit juice which adds an ever so slightly sweet taste to it. In my opinion, this margarita recipe is the perfect balance between sweet and sour! So guys, happy Cinco de Mayo! I hope you’re having fun sipping on cocktails, eating tacos and getting merry with your buds! 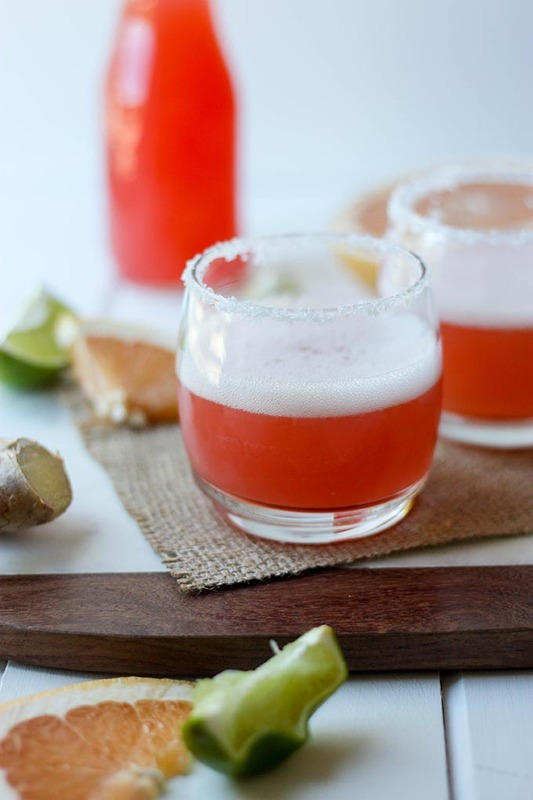 These grapefruit margaritas are the perfect balance between sweet and sour! If you're looking for an easy to make cocktail recipe, this is the recipe for you! Optional: run a wedge of lime around the rim of a cocktail glass, and salt the outside edges. Combine tequila, grapefruit juice, lime and ice in a cocktail shaker (or blender!) and shake/combine until foamy. Pour into a glass and garnish with extra lime or grapefruit. Note 1 - Adjust lime to taste. I used half a lime which was about 1/2 an oz. Add more or less depending on personal taste preferences. Note 2 - use as much or as little ice as you want. When you add more ice, you'll get more of a frozen margarita which is just as delicious! Note 3 - this is totally up to personal preferences. Personally I didn't think it added much to the drink so I left it out. This recipe originally appeared on THCK in May 2017 and has since been updated. The recipe has stayed the same! I’d LOVE to hear – what are you doing for Cinco de Mayo? What are your favourite margarita flavours? Is it ever ok to use a Nutri Ninja for making cocktails!? Remember, if you don’t want to miss a post, be sure to subscribe and follow The Home Cook’s Kitchen on Facebook, Pinterest and Instagram! Big love! Can I drink these for breakfast and call it juice??? Soooooo refreshing and grapefruit anything is my favorite 😀 Happy Cinco de Mayo Georgie!! Friends who help you taste test margaritas are the best friends to have :). These margs sound AWESOME! I love the grapefruit juice in there. And that color is gorgeous! Happy Cinco de Mayo, Georgie! First of all, happy Cinco de Mayo to you too! Second of all, these look GREAT! I love that there’s no added sugar. I can only imagine how well these 2 fruits would go together. I love the foaminess on top as well! Great job!! Cheers! I’ve been following your blog since some days. Your writing style and Pictures are very much Attractive. Adding more ice is good idea. I bet these are so refreshing! I love grapefruit – trying these soon! grapefruit is delicious! for a tart fruit it goes great with tequila! That looks so yummy and refreshing. Perfect to serve at a girls brunch. What a great thing to serve on cinco de mayo! Yum, I need one of these in my life! This recipe is awesome. it’s almost Friday! woohoo perfect time to down from margaritas! The perfect way to celebrate Cinco de Mayo! These look so delicious! Such beautiful color! This sounds perfectly refreshing! absolutely! and I love the colour too! mmm I really like this drink. Great idea for sunny summer. Looks very tasty! I definitely want to try it. Thank you for sharing this great recipe!